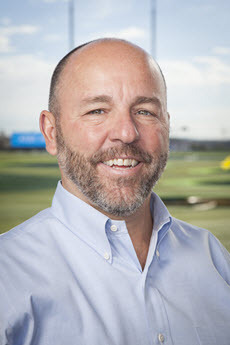 Ron Powers is President of the Topgolf Swing Suite social experience that features Topgolf simulators, comfortable lounge seating, HDTVs and food and beverage service in locations such as hotels, sports arenas, shopping centers, cruise liners and more. He is leading Topgolf’s digital innovation on the heels of its recent acquisition of World Golf Tour. Across his 30-year career in the gaming software industry, Ron has worked with the biggest brands in the business, including EA, Facebook, Google, Apple, Sony and Nintendo. Most recently, he served as president and chief executive officer of SportsWorld, Inc. His experience spans startups to large conglomerates, and he’s held senior leadership positions at Arkadium, Inc.; EA; PopCap Games; iPlay and GameHouse, Inc. Throughout his career, Ron has secured publishing rights for hundreds of games and led companies through the many stages of growth and rebirth. A fan of the Pacific Northwest, Ron attended Oregon State University and currently resides in Seattle. In his free time, he volunteers with a local animal sanctuary and enjoys golf, cycling, snowboarding, and water sports with his family and friends.